Pori is a city and municipality on the west coast of Finland. On the 18th (Sun), contemplate in the serene atmosphere at Central Pori Church (Keski-Porin kirkko), take in the exciting artwork at Pori Art Museum, then don't miss a visit to Juselius Mausoleum, then tour the pleasant surroundings at Yyteri Beach, and finally examine the collection at Villa Mairea. To see where to stay, ratings, more things to do, and tourist information, refer to the Pori trip itinerary builder site . London, UK to Pori is an approximately 9.5-hour flight. You can also drive. You'll lose 2 hours traveling from London to Pori due to the time zone difference. Traveling from London in August, expect Pori to be a bit cooler, temps between 22°C and 12°C. Finish up your sightseeing early on the 18th (Sun) so you can travel to Savonlinna. On the 19th (Mon), look for gifts at Taito Shop Savonlinna, take in the architecture and atmosphere at Pikkukirkko, examine the collection at Savonlinna Provincial Museum, then explore the historical opulence of Olavinlinna Castle, then see the interesting displays at Lusto - The Finnish Forest Museum, and finally contemplate in the serene atmosphere at Kerimaki Church. 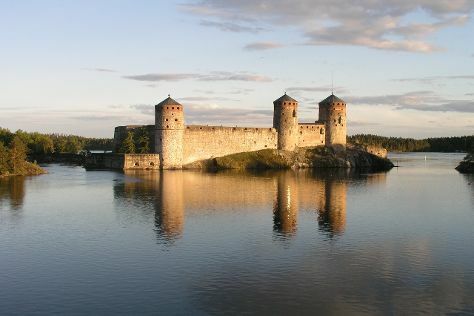 For reviews, maps, other places to visit, and more tourist information, you can read our Savonlinna online itinerary maker . You can fly from Pori to Savonlinna in 6 hours. Other options are to drive; or do a combination of train and flight. In August, daily temperatures in Savonlinna can reach 22°C, while at night they dip to 13°C. Finish your sightseeing early on the 19th (Mon) to allow enough time to travel to Kuusamo. Kuusamo is a town and municipality in Finland. On the 20th (Tue), see the interesting displays at Hannu Hautala Nature Photography Centre, then identify plant and animal life at Kiutakongas Rapids, then hike along Pieni Karhunkierros Trail, and finally experience rural life at Palosaari Reindeer and Fishing Farm. Get ready for a full day of sightseeing on the 21st (Wed): stroll through Ruka, then look for gifts at Shopping Center Kumpare, and then see exotic creatures in open habitats at a safari tour. To see where to stay, more things to do, reviews, and more tourist information, you can read our Kuusamo trip planner . Traveling by flight from Savonlinna to Kuusamo takes 5 hours. Alternatively, you can drive; or do a combination of train and flight. August in Kuusamo sees daily highs of 20°C and lows of 10°C at night. 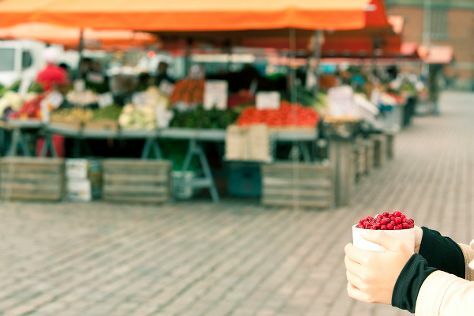 Cap off your sightseeing on the 21st (Wed) early enough to travel to Turku. Start off your visit on the 22nd (Thu): gain insight at Turku Cathedral, see the interesting displays at Luostarinmaki Handicrafts Museum, then step into the grandiose world of Turku Castle, and finally head off the coast to Vepsa Island. For maps, reviews, and tourist information, read our Turku holiday planner . You can fly from Kuusamo to Turku in 4.5 hours. Other options are to do a combination of flight and train; or drive. 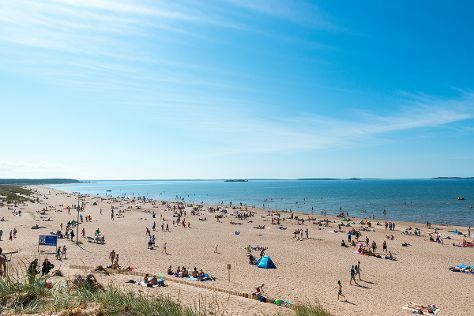 In August in Turku, expect temperatures between 23°C during the day and 12°C at night. Wrap up your sightseeing on the 22nd (Thu) to allow time to drive to Kimito Island. Start off your visit on the 23rd (Fri): visit a coastal fixture at Archipelago National Park. To find traveler tips, reviews, and other tourist information, go to the Kimito Island trip planner. Getting from Turku to Kimito Island by car takes about 1.5 hours. Other options: take a bus. In August, daily temperatures in Kimito Island can reach 24°C, while at night they dip to 12°C. Cap off your sightseeing on the 23rd (Fri) early enough to go by car to Helsinki. Kick off your visit on the 24th (Sat): learn more about the world around you at Natural History Museum (Luonnontieteellinen Museo), take an in-depth tour of Seurasaari Island and Open-Air Museum, stop by Taiga Colors, explore the world behind art at Kansallisgalleria, then test your team's savvy at popular escape rooms, and finally browse the eclectic array of goods at Hakaniemi Market. For where to stay and more tourist information, read Helsinki day trip planning app . You can drive from Kimito Island to Helsinki in 2.5 hours. Other options are to do a combination of bus and train; or take a bus. In August, daytime highs in Helsinki are 24°C, while nighttime lows are 13°C. Finish up your sightseeing early on the 24th (Sat) so you can travel back home.